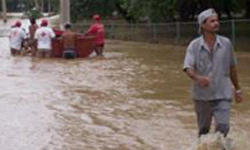 Fidel Castro is paying close attention to the flooding that resulted from intense rains that have affected eastern Cuba for the several days, said Vice President Carlos Lage Davila during a tour of the region hit by tropical storm Noel. The secretary of the Executive Committee of the Council of Ministers said that President Castro immediately recalled the floods provoked by Hurricane Flora in 1963 and called for recovery work to be carried out with intensity, according to a Prensa Latina News Agency report. Lage, who is also a member of the Political Bureau, praised the National Civil Defence System, which immediately acted to prevent the loss of any human lives stemming from to the poor weather conditions. He noted that although the damage is substantial, there is confidence that the recovery will occur in a rapid and efficient manner. More than 20,000 people had to be relocated, while the greatest damage in Santiago de Cuba Province was to roads and houses. Half of the roadways were harmed, among them more than 4,000 kilometers of roads and highways. Also damaged were 142 construction works, 24 motorway bridges and 12 railroad bridges. There was also substantial damage to the infrastructure of area aqueducts, which affects some 350,000 people. The sugar and general agriculture industries were also severely affected, while the coffee crop lost an estimated 89,000 cans of that product, which adds to the 104,000 cans lost in the previous rainy period. Lage said that recuperation work has been speeded up as much as possible, without losing sight of the situation of the dams, which are at their maximum storage capacity and in some cases overflowing. In Lages tour of the region he was accompanied by Misael Enamorado, who is a member of the Political Bureau and first secretary of the Communist Party in Santiago de Cuba.